On the subject of the classic Russian dumpling, the Book says that making them simply isn’t worth the trouble. When I was a student, my usual dinner would be either boiled sausages with pasta on the side, or pelmeni (dumplings) — unless, of course, I was staying with Granny, in which case I’d have a five-course meal. My reasons for such an abundance of choice were my complete inability to cook and therefore the ease and convenience of these products, as well as the cost factor. 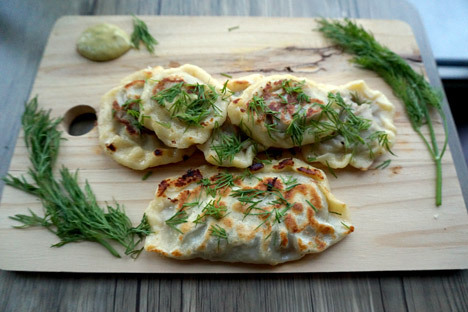 Pelmeni would always be bought frozen, dropped straight into boiling water and then enjoyed with some mayonnaise on top. There, I said it. I certainly wasn’t alone in this guilty pleasure. Freezers in supermarkets are always stacked with bags of frozen pelmeni, and it’s still a staple bachelor’s (or student) dinner. The Book of Healthy and Tasty food says that “ready-made and frozen pelmeni free the woman from the lengthy and tedious process of making them.” Amen to that! Having prepared pelmeni myself this time, I can say I’d much rather some machine at a factory did it for me. I know it’s not as special, but neither is hours spent in the kitchen rolling out very thick dough and trying to make sure the filling is sealed properly. A whole day spent in the kitchen and what do you have at the end of it? Beef bougnignon? Eclairs? Dinner for 15? Nope, pretty much just small pockets of pastry with minced meat inside! At the very beginning of my cooking school, I held a class in my kitchen with a girl from England, a girl from France and her twin babies. The twins needed far less attention than the pelmeni. The Book doesn’t even provide a recipe for pelmeni, instead explaining that pre-made dumplings really will do the trick. All you get is the list of ingredients and how to boil or fry them. I felt free to use my grandmother’s recipe, as well as to add chili and cumin into the fried onion, and followed the Book’s suggestion to fry pelmeni and have them with mustard & vinegar sauce. It was delicious. I almost wish I’d made more than six. She disagrees with the book about the value of store-bought dumplings, though. “Store-made pelmeni, although popular, didn’t taste great, so people would make their own, too, and brag about their pelmeni being the best. Later a recipe by Yeltsin’s wife started circulating, and was well regarded. Every time a family made pelmeni, they would make enough to freeze and eat for 1,2,3 months – or the whole winter. Later on ‘pelmennitsy’ came along (a device that allows you to make many pelmeni at a time) and it made pelmeni-making much easier, although many would still make them by hand,” she said. I am clearly missing the point here. The pelmeni-making -loving part of me is clearly dormant at present, despite the fact that I have a Siberian grandfather. Who knows, it might one day awake and then the freezer will get packed with frozen dough with meat. “Ready-made pelmeni are always available, and are made from best available ingredients.” I am with you on this one, Comrade Mikoyan — at least for now. Whether you have store-bought or homemade dumplings, dip them into boiling salted water and cook for 10 minutes. After that, remove the dumplings from the water with a slotted spoon. Put them on a plate. Cover with butter or sour cream and serve immediately. Many people prefer to eat dumplings with a hot sauce made of mustard mixed with vinegar. Another very tasty way to eat dumplings is to boil them in salted water for 2-3 minutes, then fry them in butter in a pan.